Guess what just popped into my inbox? No. Not info on my favourite shoe shop’s sale! Delivery date for the parcel I’m waiting for? No. Sadly. Not even the promise of a lot of money from a total stranger in Ghana. It’s this years guide Shoppers Guide to Pesticides in Produce by EWG. Yay. Why am I so excited by a list of products with pesticides in them from the US? 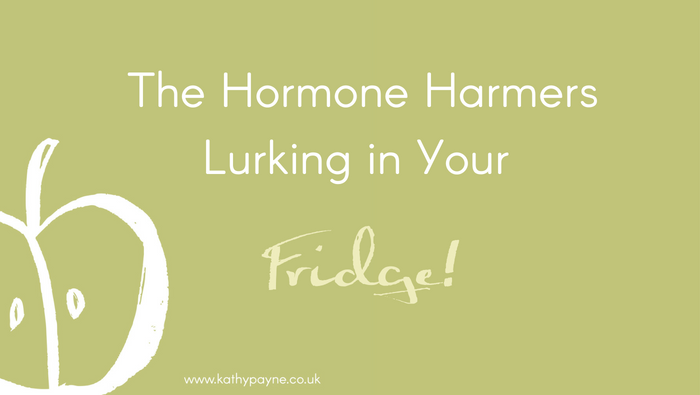 Because I don’t want those hormone harmers and health harmers lurking in MY fridge! And the issue is pretty similar in Europe. Did you know there are hormone harmer chemicals? They pretend to be like our natural hormones. They interfere with normal hormone balance. And that can cause hormonal issues. The tech term for hormone harmer chemicals is “xenoestrogens”. They are found in pesticides and plastics and much more. They disrupt hormones in women and men. There are plenty of sources who will tell you they are really safe. There are also many sources who say they are NOT safe. And it’s not just human life that is harmed. There are scary studies, which tell us they make fish are becoming female in our polluted rivers and seas. Due to the same hormone harmers. One of the sources of hormone harmers are pesticides. Those sprays farmers put on their crops to kill bugs, creepy crawlies and slugs. And stop them eating stuff. Those chemicals are still there when the produce go on sale to you and me. You could argue about “safe limits” for pesticide residue, if you like. Personally, I don’t want to rely on a safe limit made up by politicians, lobbyists or commercial companies. I’d rather make my own choice. And I want to be eating as few chemicals that are designed to KILL things as I possibly can. Pesticides are also linked to eye, lung and skin irritations, to brain and nervous system problems and to some cancers. The results published by EWG (Environmental Working Group ) each year, are based on thousands of samples of fruits and veggies. Tests are by the US Department of Agriculture . This results are published and a handy shoppers guide called Dirty Dozen and Clean Fifteen is produced. The Dirty Dozen are the most polluted fruits and veggies. The Clean Fifteen are the least polluted. So what can you do, armed with that info? Buy organic or unsprayed fruits and veggies as far as you can. Or grow your own and don’t spray them with pesticides. At least buy or grow the “dirty dozen” as organic or unsprayed. For produce that is not organic, wash and peel them to remove as much pesticide as possible. Although this won’t remove all residue. The EWG study prepares produce as it would normally be eaten before testing e.g. a banana would be peeled then tested. And you can’t peel spinach. Look at “washes” that claim to remove pesticides. They might help, but if a product has “taken in” pesticides, washing won’t remove all traces either. Buying organic also shows you support environmentally-friendly farming methods that is kinder to the environment and supports workers rights. And that’s important to many people. I Might As Well Eat Burgers If Veggies Are Hormone Harmers? So you’re thinking, I might as well eat burgers? Er no. You’re pulling that one on me. It’s still better to eat a range of fruits and vegetables than junk food. Avoiding sugar, artificial sweeteners, trans fats and additives are really important to good health and happier hormones. I just want to help raise awareness of the risks linked with food, so we can take steps to minimise those risks if we choose – for ourselves and our families. It’s all personal choice. I choose buying organic and growing my own, unsprayed as much as I can. I choose reducing my exposure to hormone harmers. EWG is a good resource for more info, if you’re keen to learn more.